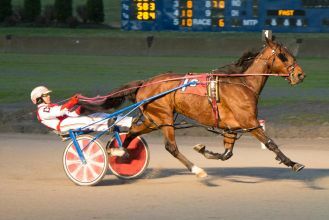 Buffalo Raceway will kick off its 66-day 2019 meet this Wednesday. This year, purses are slightly higher, with open events beginning the year at $12K — up from $10,500 at the end of 2018. In addition to increased purses, the Raceway announced that many races will be written using a class system. Some like this, others don’t. Because it is based on performance ratings and not earnings, some say a robot can write them. On Wednesday, Buffalo offers class A, B, C and D races. This class system is based on speed ratings. The faster horses run in the A race, the slowest in D. If a horse wins a D race, they move up to Class C the next time out. Most races are written based on earnings. For some, it’s easier to read French than it is a condition sheet. When you see “NW 2500 L5”, this means the race was written for non-winners (NW) of $2,500 in their last five (L5) starts. The class system is different because it uses data to classify horses. It’s based on how the horse places in races, not by how much money it has earned. Tom Agosti is the racing secretary at Buffalo and he likens the class system to that used in another type of animal racing. It makes sense to make winners move up, but the key to the class system is how it treats the bottom finishers. If a horse finishes fourth, fourth and fifth in three Class B races, it gets to move down to Class C. One win there and it’s back to Class B. The Class A race will have a higher purse than the Class D race and there are variations of the classes too. The Saturday, Feb. 2 card features an A-class race with some conditions as well. In this one, the race is also open to non-winners of eight pari-mutuel races. It’s also an optional claiming race in which a horse can be purchased for $22,500. Purses at Buffalo can change depending on how well its racino does. By law, racinos have to give a fixed percentage of their revenues to harness racing and, when you read that tracks like Yonkers, Saratoga, Monticello and Buffalo are increasing purses, it’s because things are going well at the casino side of the facility. The Class A races will feature $9,500 purses; Class B, $8,000; Class C, $6,100; Class D, $4,200. It makes things interesting, because, in harness racing, the top five finishers get what is called an “envelope”. The winner gets 50 percent of the purse, with 25 percent to the second-place finisher, 12 percent to third, eight percent to fourth and five percent to fifth. Under the current structure, finishing third in a Class A race at Buffalo is worth $1,140, which is more than finishing second in a D race, which is worth $1,050. Some believe that the class system will prevent “tanking,” because it will encourage drivers to win and move up so they can race in the higher-class and, thus, higher-purse races. It will also give the races some variety, entry-wise. At Buffalo, the same horses go at it week in and week out, the only variance being post position. Under the class system, you might get the winner of last week’s B race facing off against the winner of the A race the next week. We’ll also get a good handle on how different the racing is, as well as the finishing times. There will be days where the winning time in the C race might be faster than the winning time in the A race. That would not surprise; we see that in thoroughbred racing often where the winner of an allowance race travels faster than the winner of a stakes race. The class system is an interesting topic in the harness racing game. Some tracks, like Rosecroft and Ocean Downs — both in Maryland — use it regularly, while others, like Saratoga, do not. There has been talk of making all tracks use it, but ending the government shutdown is easier than passing legislation such as this. Buffalo Raceway is worth keeping an eye on this winter through July. A new wrinkle to the harness racing game is never a bad thing.